Well-designed classrooms can improve students’ learning progress by around 16% in a single year. Ownership and flexibility account for a quarter of this learning impact, so let’s take a look at these important factors in terms of classroom design. When children feel ownership of their classroom they feel more responsibility, and this has many positive implications for both the children’s learning abilities and the formation of their identities. Classrooms can also support individualisation by offering a variety of opportunities for different modes of learning, meaning flexibility of layout is also key. Physiological and psychological research indicates that personalisation of space is an important factor in the formation of an individual’s identity and sense of self-worth. Several studies have found that intimate and personalised spaces are better for absorbing, memorising and recalling information¹. When children feel ownership of their classroom, it appears to set the stage for cultivating feelings of responsibility². Classrooms that demonstrate the results of students’ intellectual engagement – such as projects, displays and models – have also been found to promote greater participation and involvement in the learning process³. In the Clever Classrooms study⁴, a range of factors were found to be important in two categories: aspects that helped students identify with “their” classroom; and aspects that are child-sensitive. A classroom should have a distinctive room design or characteristics that make it feel instantly familiar to children. It should include plenty of opportunity for pupils’ work to be displayed on walls and on dedicated display tables. It should include elements personalised for pupils such as named coat pegs, lockers and/or drawers. Well-designed furniture should be used to create a learning space that is child-centred. Desks and chairs should be comfortable, interesting and ergonomic according to children’s age and size. Classrooms with clearly defined breakout zones or breakout rooms were found to impact positively on learning by providing for one-to-one and small group support in a more private atmosphere. Breakout zones separate from the classroom, however, do not appear to be effective. Rooms with varied floor plans provide greater potential for creating different activity areas for younger pupils. For older pupils, squarer and larger rooms work more effectively in facilitating learning opportunities. Adequate and accessible storage is important, although too many cupboards can take up useful learning space. A good solution is to place storage such as cupboards and coat pegs within extra-width corridors, as long as circulation is not impeded. Large, accessible wall areas provide flexible opportunities for the display of information and students’ work. Younger children, who spend a lot of time engaged in play-based learning, benefit from a larger number of different learning zones. Care should be paid to allow clear through-routes between the various zones. For older pupils, who spend more time engaged in individual, formal learning or group work, fewer learning zones are necessary. Paying due attention to children’s needs for ownership and flexibility in “their” classroom is further enhanced by giving the space links to nature and the outside, such as providing windows with views onto gardens, skylights, and doors that open directly onto play areas. A modern and less traditional option is to allow flexibility in seating arrangements as well. 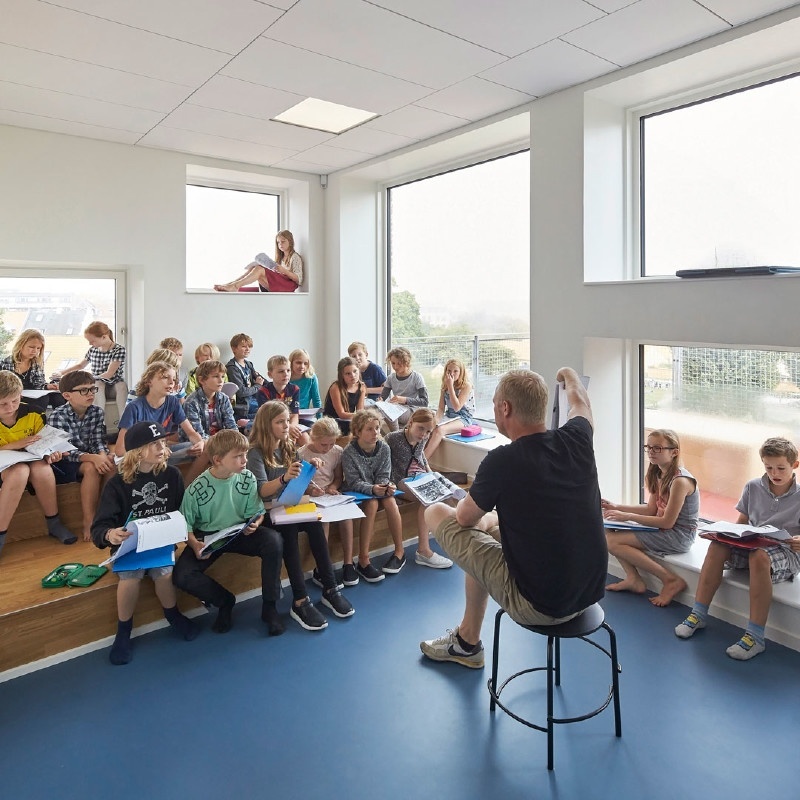 New schools like the Frederiksbjerg School in Aarhus, Denmark, are experimenting with this as can be seen in the image below, giving teachers an efficient and easy option to break the usual pattern of blackboard/whiteboard-based lectures.